In the twilight haze between wake and sleep, I heard something land on my pillow. I'd spent most of the evening prior forcing open the painted-shut window just above my bed, using a crowbar I'd purchased explicitly for this purpose. Admittedly, I was amused by the Freeman-ness of now owning a crowbar. It was summer and I could no longer stand the kiln-like nature my unventilated room assumed. Given the labours weren't exactly gentle (I was renting and it was the idiot landlord's fault that he'd painted the bloody windows shut), I imagined a broken chunk of frame or sill had come loose and tumbled next to my head. Not wanting to spend the night aspirating flecks of what was most likely lead-based paint, I grabbed and turned on the flashlight that was next to my bed. I don't remember screaming at what I saw, but I can't promise it didn't happen. Sitting on my pillow, mere inches from where my head had just been, was the biggest spider I've ever seen outside of the rainforest monstrosities kept by the zoo. I moved from my bed to the doorway with the celerity only terror can grant. As the window had been painted shut, it didn't have any kind of screen. I didn't really notice until after prying the window open. While the area around the house was ... verdant (again, awful landlord), I imagined things would be fine for one night. Fate does not like being taunted. I turned on the room's only light, fear spreading from the reactionary animalian part of my psyche into areas of active thought. It was a primal fear, fully pervading my senses- tunnel vision, that strange coppery taste, the phantom feeling of tiny crawling legs. This blended with a growing feeling of violation. I think everyone feels, at least a little, that their bed is a place of sanctuary. It offers respite from the monsters of the world, be they the imagined closet-dwelling variety of childhood or the adult beasts of work and relationships. After the invasion of something I so revile, would I ever be able to stop wondering if those deep sheets and vast undercarriage now housed further abominations? What if the thing on my pillow was a female, distended with eggs, seeking warmer environs to secure her brood? After a few half-hearted attempts to capture the creature with a tupperware container, it skittered under the bed. It was the victor and I went out to the living room to sleep on the couch, haunted by illusory spiders. The next day, I bought and installed lots of screen, deployed a can of insecticide and spent the next several nights at my girlfriend's place. Fortunately, these defenses were sufficient and there were no further incusions. Still, this incident and a myriad of other reasons made me elated to leave that hovel a few months later. Obviously, I'm a bit arachnophobic. It's not severe, I can deal with smaller spiders well enough. But the sudden and violating nature of the creature's entrance transformed the usual discomfort into absolute horror. When I picked up Deadly Creatures last week, I thought back to that night and I felt a little proud that I could play it despite my revulsion. Gameplay-wise, it's solid but not terribly novel so far. Plus it reminds me a little of Bad Mojo, as you're an invertebrate in both, and I remember that quite fondly. Deadly Creatures is still unsettling and it makes my skin crawl, but I can cope. Although it may be affecting my perception a bit; walking home, a bit of discoloured stone looked spider-y enough to give me a small jump and things skitter in the periphery of my vision a little bit more. Given the recent release of F.E.A.R. 2, a game ostensibly as much about scares as shooting, I can't help but compare it and Deadly Creatures. I played the demo of F.E.A.R. 2 and while it had a few jumpy moments, Deadly Creatures is a vastly scarier game for me. While I understand that's certainly not ubiquitous, I've been thinking a lot about my reactions to both games. While quite elusive, I wonder how the feelings it evokes could be yoked to create games that can create fear meaningfully, instead of abusing the cheap tricks films have exploited for decades. This has become a bit longer than I expected, so I'll break this up into two posts. In a few days, I'll talk about the scariest games I've ever played (and they don't all involve spiders). I'll also look at two films that did fear extremely well. If we want to recreate their excellence in creating real scares, we're going to have to question some pretty fundamental assumptions we have about games. I hope you'll join me. I will follow your lead and admit I too am terrified by spiders, even small ones give me the shivers.This has lead to some startling moments playing World of Warcraft. Although the graphics are not nearly realistic enough to fool me into thinking an arachnid is on my screen, I still refuse to partake in any quests that has me collect poison sacs from the monstrously large spiders of Azeroth. Has I been in your shoes that night, I would have destroyed my room trying to smash that head-crab wannabe with the newly purchased crowbar... right after I put on a full body hazmat suit. @Jorge I salute your admittance of arachnid horror. I think more people are skeeved out by spiders than will admit it. 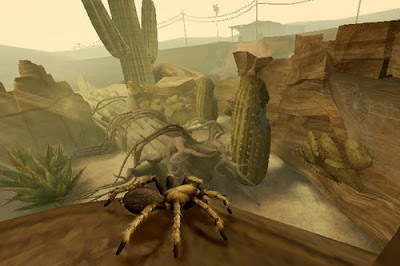 I adore the Thief games but am unable to play the original because of those insidious arachnids. It took me years to get around to playing System Shock 2 because I couldn't even attempt it without the No Spiders patch. I once found a spider crawling out of my sheets when I was making my bed and I slept on the sofa for two nights afterward. Very interesting: I am arachnophobic. I think primal is a good way to describe these sensations. Though I think the best way to describe it is by definition of phobia: Irrational. It defies conscious reason. You see, I'm not afraid of spiders at all. In fact, I love them and am fascinated by them. I enjoy learning about them, can name a number of the varieties that live near me, and provided the setting is nice and controlled and there is a thick pane of glass in the way, I will stare at them and watch them for extended periods of time. However, just reading your story here has me itching all over my body, and I can feel that my heart rate has risen. Seeing a spider on the floor unexpectedly will often cause me to freeze in spot and be unable to breathe. On occasion, I've actually unconsciously fled the room and been physically unable to re-enter the room until my girlfriend has killed the spider and shown me its corpse. As far as applying this kind of fear, well, that's tricky. I'm not too well versed in the psychology of phobias, but as I understand it, it's an abnormality, a miswiring so to speak. This inherently makes it subjective. Although spiders, I think, thrive largely on fear of the unknown: We all know that many spiders are poisonous or at least bite, but we can't identify them so we don't know which ones are safe and which ones aren't. As well, spiders like small spaces and are lovely contortionists, so they could be hiding anywhere. They move unpredictably, they have 8 eyes, each shining with a grim intelligence: what are they plotting up there on the corner of the wall?